Developed by GoDataDriven to create a benchmark in the field, the 10-day program combines in-depth lectures with hands-on hackathons and propels data scientist to a higher standard of excellence. This program is suited to experienced data scientists who want to escalate their skills to the next level. The 10-day Data Science Accelerator Program is available for individual registration and covers all essential topics is scheduled to start in March and September, 2018 in Amsterdam. Training days for the public Data Science Accelerator Program have two-week intervals, this means that you will have one training day every two weeks. The total program runs for a five month period. Our data specialists look forward to share their expertise. 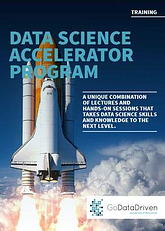 Download the brochure - Data Science Accelerator Program!